Nathalie Tcherniak was born into a family of assimilated, intellectual Russian Jews and brought up mostly in Paris by her emigré father after her parents divorced. She wrote her first novel at age 12. She attended the Lycée Fénelon and graduated with a licence in English from the University of Paris-Sorbonne in 1920. She then spent a year studying history at Oxford University and six months studying philosophy and sociology at the University of Berlin. In 1925, she was awarded a law degree by the Faculty of Law in Paris, where she met Raymond Sarraute, also a lawyer. The couple married that same year and had three daughters. Nathalie Sarraute was a practicing member of the bar from 1926 to 1941, before dedicating herself full-time to writing. Her first book, Tropisms, a collection of 24 brief texts that appeared in 1939, marked a fresh direction in French literature. Soon thereafter, Nathalie Sarraute went into hiding under a false name to survive the German Occupation of her country during World War II. She participated in the French Resistance. Later she became a leading member of the French experimental style "new novel" movement along with Alain Robbe-Grillet, Claude Simon, and Marguerite Duras. In 1964, she received the prestigious Prix International de Littérature for her novel Les Fruits d'or (The Golden Fruits). She was 83 years old when she had her first bestseller, her autobiographical work Childhood. In 1996, Nathalie Sarraute had the rare honor of having her works published during her lifetime in the classic Pléiade collection. 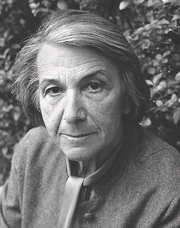 Nathalie Sarraute is currently considered a "single author." If one or more works are by a distinct, homonymous authors, go ahead and split the author. Nathalie Sarraute is composed of 8 names. You can examine and separate out names.